Real Madrid wonderkid Vinicius Jr was bitten on the head during Castilla’s 2-2 draw with Atletico Madrid! The 18-year-old moved to Santiago Bernabeu this summer, the club having agreed a €45 million (£40m/$52m) deal with Flamengo last year. And he showed his worth during the derby, scoring twice, the first a clever finish after a bursting run from the left flank, the second a sublime long-range effort into the top corner. However, it is the actions of Atletico player Tachi which have caught attention, as he bit Vinicius after a tackle. With the pair on the ground, Tachi sank his teeth into the Brazilian’s head, leaving the attacker aghast. The referee only issued Tachi a yellow card, however, and also booked Vinicius for dissent, much to his chagrin. Real coach Julen Lopetegui was in the stands to witness Vinicius’ performance, and the bite that it included. Indeed, Vinicius is set to spend the season with the Castilla side, with the club having numbers in attack after the signing of Mariano Diaz from Lyon. Click the links to watch more football news or other football videos. When Manchester United’s teamsheet for the 2-0 win over Burnley on Sunday included Jesse Lingard and Paul Pogba in the starting XI and Marcus Rashford among the substitutes, it was the 3,926th consecutive occasion on which they had named at least one academy graduate in their lineup stretching back almost 81 years. It is a record the club is rightly proud of, showing that their commitment to developing players dates back to long before the famed ‘Class of 92’. Pogba may well continue to divide opinion after his missed penalty at Turf Moor, but Lingard was a constant thorn in Burnley’s side. Meanwhile, it was an educational afternoon for Rashford, who came on as a second-half sub only to be sent off within 10 minutes for a petulant, retaliatory head-push on David Bardsley. Ricky Sbragia’s reserve side are unbeaten so far in 2018-19 having made the drop to Division Two of Premier League 2 after a disappointing season last term. Whereas the under-23s struggled for goals 12 months ago due to a high turnover of players, this time around they have started well in front of goal. The highlight has been Angel Gomes’ first three goals at this level following his promotion towards the end of last season, while fellow US tour inclusion Tahith Chong joined him on the scoresheet in the opening 2-2 draw at Derby. Attacking midfielder DJ Buffonge has also started the season on the right foot with two goals, while 17-year-old Jimmy Garner has not looked out of place after making the step up from the under-18s. The central midfielder, who started for Jose Mourinho’s first team against the San Jose Earthquakes in July and then came on as a late sub in the win over Real Madrid, has shown a maturity in the centre of the park which belies his speedy elevation to reserve-team football. At the back, the return of Regan Poole from a year-long loan at Northampton to play alongside Ro-Shaun Williams has made Sbragia’s outfit a far more solid unit than they appeared at times in their relegation campaign last time around, while Lee O’Connor’s excellent progress continues to catch the eye at left-back. Friday’s 1-0 win over Stoke City at Old Trafford, secured by Gomes’ first-half strike, whet the appetite for another appearance at the Theatre of Dreams, with Reading visiting on September 14 in United’s next under-23 fixture. Just as the under-23s sit in fourth place after four games, so too do Neil Ryan’s under-18 side after suffering their first defeat of the campaign at Middlesbrough on Saturday. Prior to that 3-1 reverse, the youngsters had been in fine form despite having been pegged back three times on the opening day in a 3-3 draw with Derby County. Mason Greenwood, who scored twice in that game, netted one in each of the following victories against Liverpool (3-1) and Stoke City (5-1) to take his early tally to four following his 17-goal season in 2017-18, although he did fail to hit the mark from the penalty spot against both Derby and Stoke. The win over the Potters at The Cliff featured a stunning full debut in the under-18 age group for Charlie McCann. Coming off the left of the attack, the 16-year-old addition from Coventry City netted twice in the one-sided result, including one effort inside four minutes when bamboozling the Stoke back line. Later in the same game, Warrington-born Mark Helm came off the bench for his first 10 minutes of football in a United under-18s fixture and netted United’s fifth. One player worthy of particular note so far this season has been Arnau Puigmal. The Spanish midfielder has been switched to right-back by Neil Ryan and has taken to the role superbly for the most part. His driving runs on the overlap were a particular threat against Stoke, while on Saturday at Middlesbrough he netted United’s only goal. United appear to be in good hands at this level under Ryan, who replaced Kieran McKenna as coach this summer following the Northern Irishman’s elevation to first-team coach. Want to watch more football videos? Click this link. Gareth Bale, Cristiano Ronaldo, Lionel Messi and Mohamed Salah have all been nominated for the Puskas award. The prize is given to the best goal scored in a season, and a total of 10 players are set to battle for the gong, with the likes of Benjamin Pavard and Ricardo Quaresma also nominated. The winner will be decided by a fan poll, and will be announced at a ceremony in London on September 24. Bale’s goal against Liverpool was beaten out by Cristiano Ronaldo for the Goal of the Champions League Tournament, but that could be flipped on his head at the Puskas Awards. Indeed, the Welshman scored a staggering overhead kick against Liverpool in the final, while Ronaldo’s bicycle kick against Juventus led to a standing ovation from fans, and ultimately convinced the Portuguese to move to the Italian giants. A number of World Cup strikes are included in the nominations, most notably defender Benjamin Pavard, who scored a stunning volleyed effort in France’s brilliant win over Argentina. Denis Cheryshev’s super strike for Russia against Croatia is also a potential winner, while Messi’s slaloming run and finish against Nigeria is among the voting, along with Quaresma’s sublime outside of the boot effort versus Iran. Back in the club game, Mohamed Salah, a beaten Champions League finalist, could have had a number of his 44 goals last season included in the nominations, but FIFA have settled on his strike in the Merseyside derby against Everton, where he beat two players before curling an effort into the top corner. A number of lesser-known players have also been given a chance to steal the limelight, with Riley McGree perhaps the player who posts the most danger to Ronaldo, Bale and Salah. The Club Brugge midfielder is currently on loan at Melbourne City, but he scored his goal for Newcastle Jets, netting with a flick of his heel from outside the box against, ironically, the club who now have him on a short-term deal. Lazaros Christodoulopoulos is also in the running, his world-class free kick from range stunning Olympiakos and his team-mates, and earning himself a move to the team he scored against, while Giorgian de Arrascaeta scored a superb flying scissor kick for Cruzeiro against America MG.
Olympiacos’ faithful have given Cote d’Ivoire’s Yaya Toure a heroic reception having arrived on a free transfer. Having fallen down the pecking order at Manchester City, the midfielder left English champions at the end of last season. And has returned to the Greek Super League side . The Ivorian midfielder was given a kingly reception by the club’s fans, following his arrival at the Karaiskakis Stadium. Also, Toure has made known his reasons behind snubbing offers from other clubs over the summer for his former employer. “It is an honour to be back at Olympiacos! When I left in 2006 I said I would come back and I am delighted to keep my word. I had offers from lots of clubs across Europe, Asia and the USA. Ultimately, I made my decision based on the special relationship I have with this incredible club,” Toure told club website . “I am as hungry for success now as I was when I first arrived here many years ago and I cannot wait to help the club win the trophies the great fans of Olympiacos deserve. “It is now time to let my football do the talking once again. Let’s do this,” he said. Toure will be looking forward to proving his worth when Olympiacos slug it out with Asteras Tripolis at the Stadio Georgios Karaiskaki on September 14. Less than a week remains for the latest edition of the Indian Super League (ISL) to kick off and squad rosters of the 10 teams are starting to taking shape. Having had made their maiden appearance in the competition last year, Jamshedpur FC have been making some moves in the summer ahead of their second season in the ISL. Spanish coach Cesar Ferrando has taken over the reins at the club following Steve Coppell’s departure to ATK. We take a look at the seven overseas signings the Steelmen have made so far. Australia’s all-time leading goalscorer has signed for the club as a marquee player in a move that has generated plenty of headlines. The 38-year-old forward was a stalwart for Everton in the Premier League for eight seasons and has earned legendary status for Millwall with whom he enjoyed two separate stints including his first as a professional player in England. An excellent header of the ball, Cahill’s trademark goal celebration will be arriving on Indian soil sooner rather than later. The 32-year-old winger has come up through the youth ranks of his hometown club Atletico Madrid. Having plied his trade primarily in the lower divisions of Spanish football, the winger’s goal clinched SD Huesca’s maiden promotion to LaLiga in 2009. He transferred to Italian side Udinese in 2010 but failed to make a single appearance after being sent out on loan back to Spain in both his seasons with the club. The Spanish defender is now a well established face in the ISL having participated in three seasons of the competition already. The upcoming season will be his second with the Jamshedpur club for whom he made a total of 18 appearances last season while also grabbing a goal. Prior to his move to the Steelmen, Tiri spent two seasons with ATK and was a vital cog of their title-winning side of 2016. He began his career at Cadiz in Spain before signing for Atletico Madrid’s B team in 2012. The Brazilian midfielder is another player which has been retained by the club going into its second ISL campaign. Like Tiri, Memo too appeared in all 18 matches played by Jamshedpur last season. This will be his third season in the ISL with his first coming with the Delhi Dynamos in 2016. The 30-year-old defensive midfielder has played for various Brazilian clubs for the large part of his career with his stints in India being his only overseas moves. One of the five Spanish outfield players in the ranks of Jamshedpur going into the season, Pablo Morgado will be marking his maiden stint abroad with the ISL move. The 29-year-old winger came up through the youth ranks of Valencia before stints with various clubs in the lower divisions of Spanish football. His last stint before his ISL move was with Valencia-based CF La Nucia who ply their trade in the fourth tier of Spanish football. The 27-year-old Spanish attacking midfielder came up through the youth ranks of Collado Villalba and Atletico Madrid. Between 2009 and 2013, he played for Atletico Madrid’s B and C teams before signing for Real Zaragoza on loan in 2013. He spent his last four years at Albacete Balompie and Ponferradina in Spain’s second and third tier respectively prior to signing with the Jamshedpur-based club. Hailing from Alicante in Spain, Mario Arques is a midfielder by trade. The 26-year-old Spaniard spent his formative years at Villareal before stints with the B team of Valencia, Elche and Sporting Gijon. In 2015, he made his LaLiga debut with Elche in a 0-3 loss to Atletico Madrid. Arques’ only stint abroad prior to his move to India came with Ukranian Premier League club FC Karpaty Lviv last year. Caf Champions League and Confederation Cup quarter-finalists will know their opponents when the draw will be conducted on Monday. For the Champions League, all teams that finished as runners-up in their respective groups Esperance, ES Setif, Horoya and Primeiro Agosto will be placed in Pot 1. Each group winner will be in their own pot of three balls, with Al Ahly in Pot 2, TP Mazembe in Pot 3, Wydad Casablanca in Pot 4, while Etoile du Sahel will be in Pot 5. A ball would be picked from Pot 1 which contains the runners-up. Then the team chosen will be revealed. Balls would then be picked from other pots that have teams that were not in the same group as the revealed team from Pot 1 and placed in the empty Pot 6 where they are mixed. The ball picked from Pot 6 will contain the team that will face the one from Pot 1 for Quarter-final 1. A repeat of the same process will be done three more times to come up with pairings for Quarter-finals 2, 3 and 4. The runners-up will play first leg matches at home as per regulations. As for the Confederation Cup, a similar process as the Champions League is followed. Pot 1 will contain runners-ups AS Vita, Al Masry, CARA Brazzaville and Rayon Sports. Group winners Raja Casablanca will be in Pot 2 with three balls, RSB Berkane in Pot 3 while Enyimba in Pot 4 and USM Alger in Pot 5. A team picked from Pot 1 will be revealed before picking balls from pots that have teams that were not in the same group as the revealed side and placed in Pot 6. After the mixing of balls in Pot 6, a picked team will be paired with the side from Pot 1 for Quarter-final 1. The same process will be repeated three more times to determine 2, 3 and 4. Just as in the Champions League, the runners-up will play the quarter-finals first legs at home. Dimitar Berbatov has revealed he told his agent to “f**k off” when he was told of Manchester City’s interest in signing him in 2008. The Bulgarian moved from Tottenham to Manchester United on one of the most intense deadline days in recent memory, sealing a £30 million ($38m) move with minutes to spare. City, of course, were the subject of a takeover on the same day, and amazingly swooped to sign Robinho from under the noses of Chelsea. The Blues were not satisfied with stopping there, however, and launched a bid to steal Berbatov away too. Spurs reported United to the Football Association due to the nature of their pursuit of the striker, and reports at the time claimed that selling Berbatov to City would have been more palatable for the London club. The side made an offer in excess of United’s, reported to be £34m ($43m), but Berbatov was not interested, and told his agent as much! Speaking to FourFourTwo regarding City’s interest, he said: “I don’t think it was that close, to be honest. My agent told me about some interest but I said, ‘Don’t even bother mentioning anyone else, I’m going to Man United,’ because of the history, the players, the tradition, everything. Berbatov left a Spurs side who had not won any of their opening three games, and was widely regarded as a pariah among the club’s fans. However, he maintains that he was merely “following his path”. “It’s difficult,” he added. “You see it all the time with players moving clubs. In my case it was me simply following my path, because ever since I was a small boy, I’d always imagined playing for the biggest club in the world. 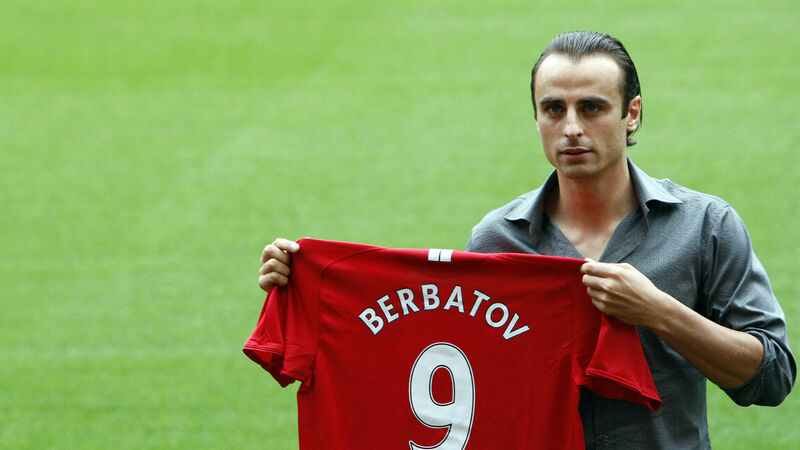 Berbatov won two Premier League titles during his time at United, as well as the League Cup and the Club World Cup. The Bulgarian scored 56 goals during his time at Old Trafford, leaving for Fulham in 2012. Since that move, he has played for Monaco, PAOK and Kerala Blasters. He won 78 caps for his country.